Kraftanlagen is building state-of-the-art plant technology throughout Europe. The company’s services comprise of the entire value chain ranging from research and development, concept, project planning and engineering to procurement, supply and fabrication, construction, installation, and commissioning to service and maintenance, decommissioning and dismantling. Kraftanlagen is an experienced general contractor, that can engineer and build quickly controllable power plants on the basis of gas turbines, gas and steam turbines, engines and boilers for different areas of application with fuels such as biomass, gas, coal and oil. Kraftanlagen plants are designed to be flexible and utilise the principle of combined heat and power generation, which achieves a high-degree of efficiency by jointly generating power, heat and refrigeration. The company also has comprehensive expertise in the latest processes, such as power-to-heat, thermal storage, and concentrated solar power (CSP). Kraftanlagen optimises efficiency and flexibility and, as a result, the profitability and environment-friendliness of power plants. It can achieve this goal not just with newly constructed plants but also when modernising existing ones. Kraftanlagen engineers, erects and maintains plants for power, hot water, steam and refrigeration supply, as well as cremation systems. The company always works independently of the manufacturer; ensuring that customers receive unique solutions that meet their demands. Kraftanlagen’s project responsibility far exceeds the engineering and erection of plants and also includes ongoing plant optimisation, as well as a reliable service infrastructure and 24 hour on-call service. Kraftanlagen engineers and builds grids for the distribution of natural gas, steam, as well as hot, warm and drinking water. Its range of services in district heating, gas and water supply includes detail engineering, supply and installation of all piping systems and components, civil engineering and technological maintenance tasks. Kraftanlagen completes all installations as general contractor or as individual lots. Proven logistics and coordination reduce the construction period to a minimum. Customers can rely on Kraftanlagen, as it ensures a fault-free use of the supply network over a long service-life. Kraftanlagen specialises in services that cover the entire life cycle of nuclear plants including post-operation and dismantling of such plants. As part of large international projects like CERN and ITER, the design solutions of the company’s engineers and scientists are contributing to taking the results of high-level research and applying it on an industrial scale. For the industry, Kraftanlagen build piping systems and plants suitable for media, as well as temperature and pressure ranges. During revisions and for maintenance and repairs, the company will give customers total commitment on site. As a partner of the chemical and petrochemical industry for many years, the Kraftanlagen Group maintains specialised branches in Germany and Austria, as well as subsidiaries in Romania. Kraftanlagen creates the perfect conditions for the operation of plants, power plants and buildings. This is achieved using air conditioning and ventilation technology, media technology, water treatment and drinking water hygiene, electrical, instrumentation and control technology (EI&C), fire protection and safety technology, as well as service and maintenance. The utility services of the Kraftanlagen Group stand for rapid response times, flexibility, commitment and the high availability of staff and spare parts. The company will have a permanent presence on site for large projects and regular customers. Keeping stocks of products and materials on the customer’s premises is also part of the service. Kraftanlagen engineer, procure, install and maintain fire alarm and fire fighting systems for industry and power plants, as well as public and commercial buildings. Only systematically linking fire protection systems, early fire detection systems, fire alarms and stationary fire fighting systems provides optimal protection for people, buildings and property. Kraftanlagen experts engineer and build complete fire detection and fire fighting systems. The company also engineers, calculates and designs plants that meet the needs of investors and operators, as well as environmental, safety and health regulations. Experienced in process technology, EI&C technology and civil engeeniring, our engineers, technicians and project managers in Munich, Burghausen and Ploiesti develop top quality solutions. Kraftanlagen is building and checking piping systems and components for power plants, industry and pipelines at our own production facilities in Eberswalde and Haiming. With mechanical technology equipment for inductive and cold bending, heat treatment, cutting and welding tasks as well as mechanical processing, Kraftanlagen covers all market requirements for piping systems and components for power plant, chemical plant and industrial plant construction, offshore windfarms, and pipelines. It has many years of experience in processing high-alloyed steel and stainless steel. Kraftanlagen trains welders, consult on the choice of materials and conduct material tests and damage inspections. The company’s welding and testing technology department advises and supports the projects of the Kraftanlagen Group departments and ensures that its products meet the highest quality standards. Bouygues Construction and Colas Rail have closed the acquisition of all shares in Alpiq InTec AG (Zurich) and Kraftanlagen München GmbH (Munich), whose activities were brought together in Alpiq Engineering Services. CSP has the unique advantage over wind and solar PV that primary energy storage can be directly integrated into the power plant. Kraftanlagen engineer and build highly flexible power plants that allow municipal and commercial customers to make use of control energy and heat extraction. Kraftanlagen specialises in services that cover the entire life cycle of nuclear plants, including dismantling and post-operation solutions. Kraftanlagen has developed its own process with an open volumetric receiver and air as work medium. It is inexpensive, environment-friendly and supplies power and heat from solar energy. Kraftanlagen München discusses its concentrated solar power (CSP) solutions in this brief company video. German municipal utility, Stadtwerke Kiel, is developing Europe's most modern gas engine heating power plant on the eastern shore of the Kieler Förde inlet in northern Germany. Alpiq is selling its industrial business, creating added value for the group and strengthening its core business. The K.I.E.L coastal power plant, which is the most modern and flexible gas engine-based combined heat and power (CHP) plants in Europe, has received its 20th and final gas engine. Kraftanlagen Heidelberg (KAH) has been contracted by a European Commission Joint Research Centre (JRC) to source, fix, assess, and system check a waste cementation plant for the inertisation of radioactive waste in Ispra, Italy. Kraftanlagen Group has purchased Switzerland-based Diamond Lite SA, a company specialising in hydrogen gas generation plants. 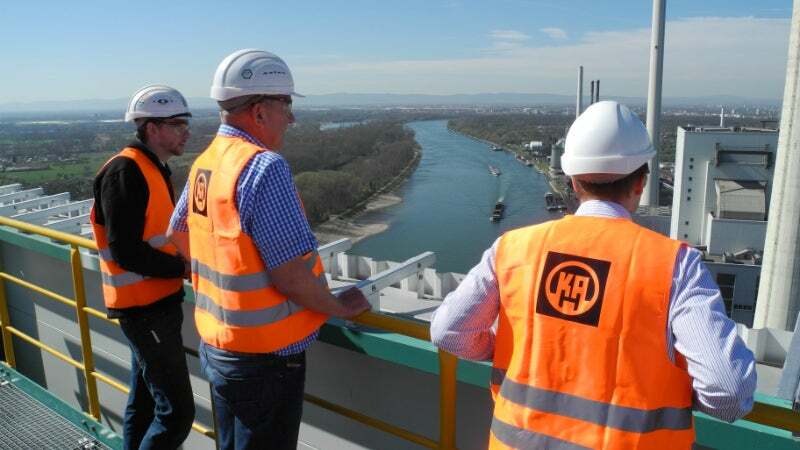 On November 11, the Supervisory Board of Stadtwerke Kiel AG approved the construction of a gas engine heating power plant and commissioned Kraftanlagen München (KAM) with the project's execution as general contractor. With the purchase of the Romanian engineering company, the Kraftanlagen Group has expanded its service portfolio as a general contractor for the chemical and petrochemical industry. Kraftanlagen Heidelberg GmbH (KAH) and STEAG Energy Services GmbH (SES) believe that pooling their competencies will increase their market penetration and provide them with greater access to the national and international nuclear power plant decommissioning market. Kiel - Stadtwerke Kiel (Kiel public utility company) has ordered a gas engine heating power plant (GHKW) with combined heat and power generation from general contractor Kraftanlagen München (KAM) and its partner, GE's Jenbacher Gasmotoren. Certifying KAM according to Section III of its Boiler & Pressure Vessel Code (BPVC) for the construction of nuclear facility components, the American Society of Mechanical Engineers (ASME) acknowledged that KAM is able to operate worldwide in the highest code classes within the nuclear industry.